iOS devices have completely changed the way we write. Not only has iOS given us the flexibility to quickly jot down our thoughts wherever and whenever they strike, it's fundamentally flipped our expectations of the humble text editor. In an effort to maximize every pixel of screen real estate, developers rethought what was necessary for productivity and efficiency on our mobile devices, from the size of the canvas to the way we interact with buttons, bars and ribbons. The result left us with minimal, distraction-free environments where the only things that matter are our words. And as formatting bars and font menus became obsolete on our iPhones and iPads, a funny thing happened: They became less important on our Macs, too. From iAWriter to Pages and even Microsoft Word, the streamlining of the word processor has created a world of smart, lightweight interfaces built to adapt to whatever device we happen to be using. As someone constantly switching between my Mac, iPad, and iPhone, the seamless experience has become an indispensable part of my workflow. My writing sessions are no longer tethered to a desk, but it's not just the freedom I enjoy—the cross-platform congruity has become just as important to my productivity, letting me literally pick up where I left off without losing any momentum my train of thought may have. But even more than that, the tailored interfaces help maintain my focus no matter the size of the screen I'm working on. Having a digital notepad within constant arm’s reach is one thing, but staying in a writing groove is quite another—the feature and font familiarity across my Mac and iOS devices keeps my eyes and concentration from wandering. When I come across a new writing app in either the iOS or Mac App Store, the first thing I do is check the other to see if a companion is available. It’s hard to say definitively what makes a good cross-platform writing app, but I instantly know when I’ve found one. A good use of fonts is important, but a wide selection isn't necessary—for example, Vesper doesn't let you stray very far from Ideal Sans, but it absolutely would be on this list if a Mac component were available. Also, a pure writing space is nice, but menus and sidebars aren't an immediate turnoff. Simply put, the essence of a great text editor is more than the sum of its fonts or keyboard bars. Long before the minimalist trend, Ulysses put a heavy focus on writing rather than formatting, giving authors the tools they needed to brainstorm, organize, and create their projects with ease. Today, Ulysses III (Mac, $45; iPad, $20; iPhone, $1) has evolved and matured into the premier writing experience on the Mac. The recent release of a major version 2.0 upgrade has raised the bar so high it’s hard to imagine a better experience on any platform. With full support for Yosemite and an overall refining of the paneled interface, its eloquence is only trumped by its flexibility. Ulysses III on the Mac more than lives up to its namesake's lofty pedigree. 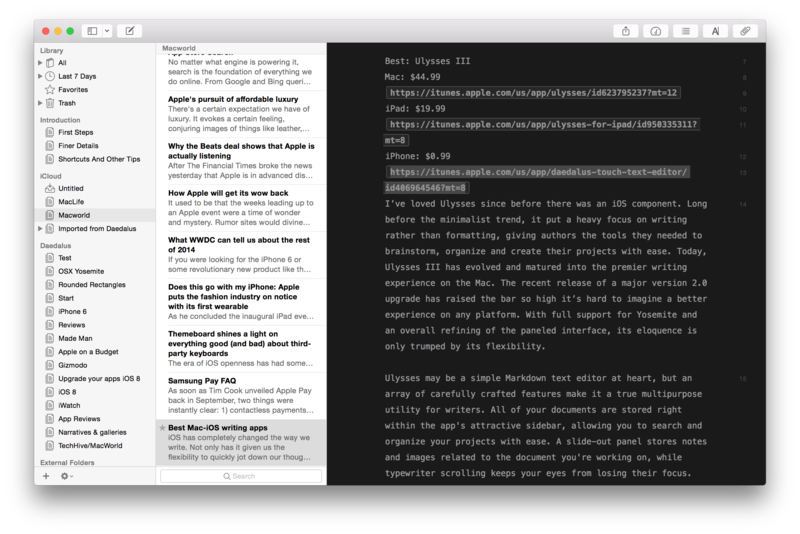 Ulysses may be a simple Markdown text editor at heart, but an array of carefully crafted features makes it a true multipurpose utility for writers. All of your documents are stored right within the app's attractive sidebar, allowing you to search and organize your projects with ease. A slide-out panel stores notes and images related to the document you're working on, while typewriter scrolling keeps your eyes from losing their focus. 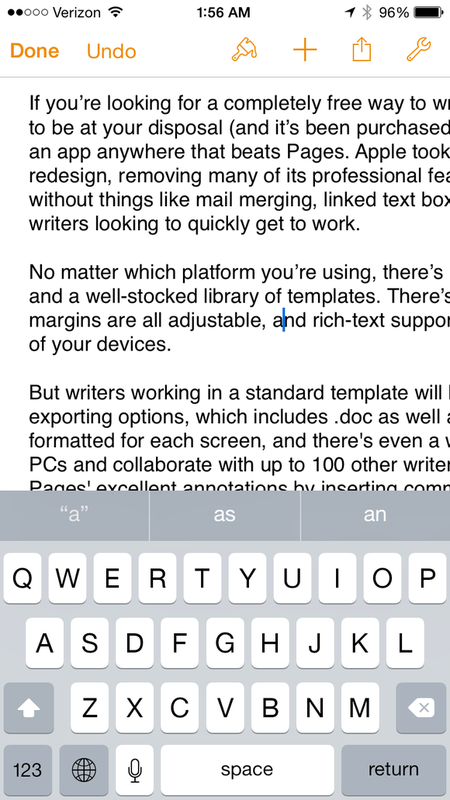 And unlike many of the other text editors I’ve used, The Soulmen didn’t water down its vision for iOS. 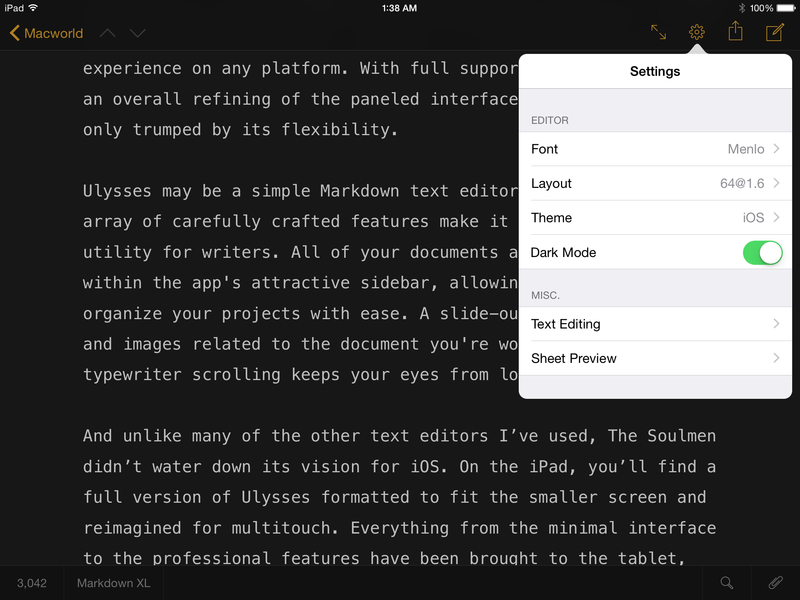 On the iPad, you’ll find a full version of Ulysses formatted to fit the smaller screen and reimagined for multitouch. Everything from its minimal interface to its professional features has been brought to the iPad, but nothing about it feels cramped or crowded. Everything that's great about Ulysses on the Mac is even better on the iPad. As you switch between Ulysses for Mac and Ulysses for iPad, iCloud keeps your documents safe and synced, but it's the uniform experience that will keep your words flowing. Fonts and themes match across both devices, and many of the things that make Ulysses great in OS X, such as attachments, exporting, and picture-perfect previews, all make an appearance. And of course there are some features that only make sense on the iPad. Slide your finger over the keyboard to control the cursor. Tap the extra row above the keyboard to bring up things like word and character count (including within selections), Markup styles (and an excellent set of punctuation shortcuts if Markdown isn’t your thing). Swipe a document name to move, copy, or export. It's all extremely simple and intuitive, and The Soulmen has gone to considerable lengths to create a smooth transition between the two apps. On the iPhone, there's Daedalus Touch, a unique, extraordinary text editor in its own right, but it doesn’t follow the Ulysses aesthetic, at least not yet. Instead of panels there’s a system of stacks and sheets that mirror the ones in your OS X sidebar. However, since it syncs only with the Mac and not the iPad, working across all three devices isn’t exactly seamless. Thankfully, an iPhone version of Ulysses is already in the works, so these continuity issues shouldn't last too long. Besides, the Mac-iPad Ulysses tandem is so tight, it's not a deal-breaker in the slightest. 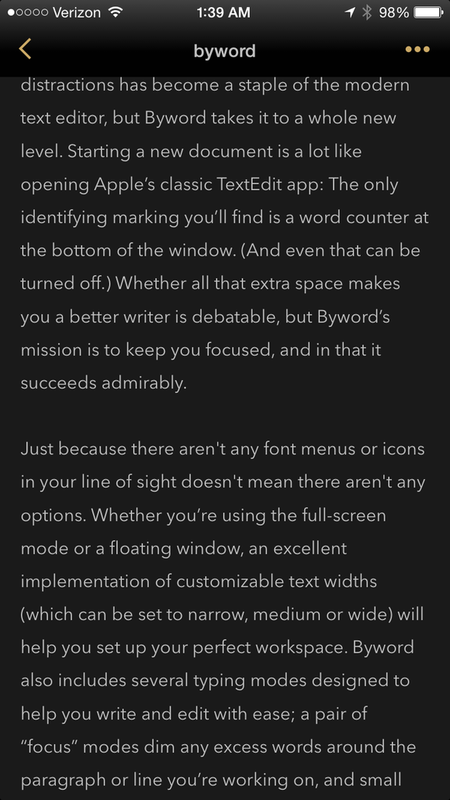 A canvas free of icons, menus, and other distractions has become a staple of the modern text editor, but Byword (Mac, $12; iOS, $6) takes it to a whole new level. 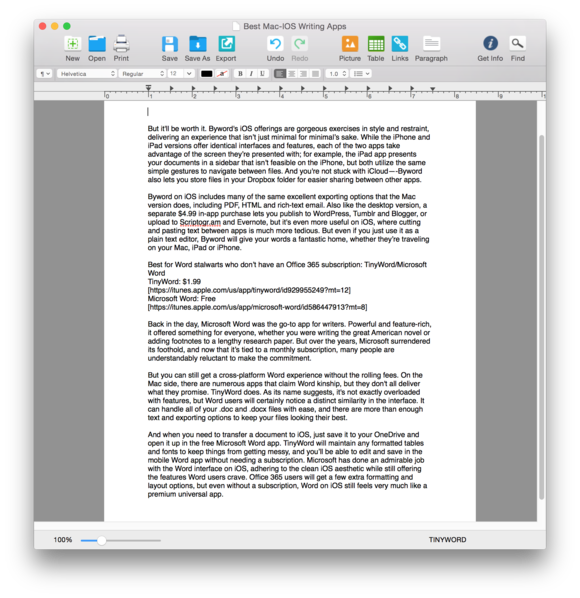 Starting a new document is a lot like opening Apple’s classic TextEdit app: The only identifying marking you’ll find is a word counter at the bottom of the window. (And even that can be turned off.) 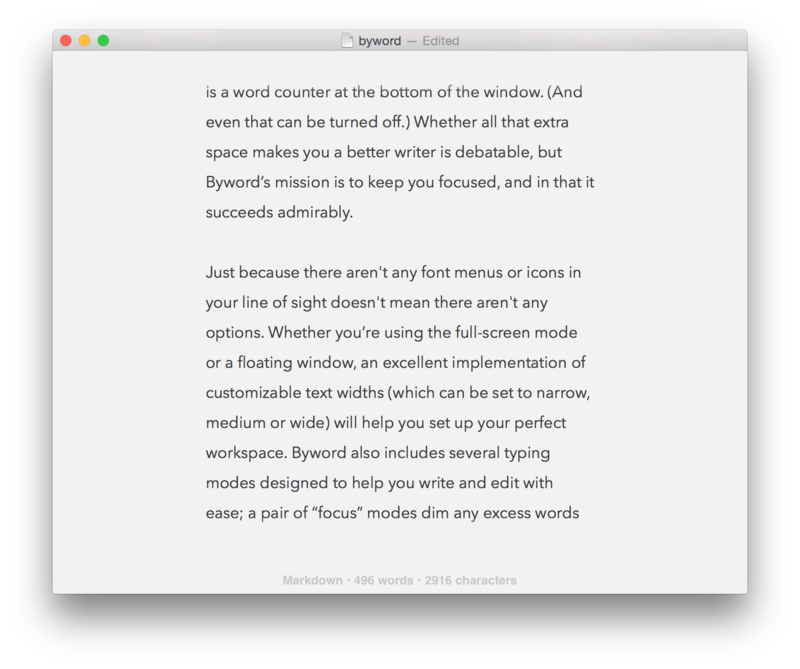 Whether all that extra space makes you a better writer is debatable, but Byword’s mission is to keep you focused, and in that it succeeds admirably. Byword's barely-there Mac interface puts the mini in minimal. Just because there aren't any font menus or icons in your line of sight doesn't mean there aren't any options. Whether you’re using the full-screen mode or a floating window, an excellent implementation of customizable text widths (which can be set to narrow, medium, or wide) will help you set up your perfect workspace. Byword also includes several typing modes designed to help you write and edit with ease; a pair of “focus” modes dim any excess words around the paragraph or line you’re working on, and small touches like paragraph indents and insert-able lists make outlines and quick notes simple and elegant. 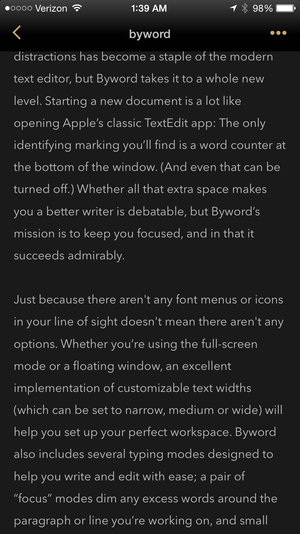 Byword's minimal approach to writing feels right at home on the iPhone's small screen. Byword excels as a Markdown editor, but if you're not proficient in the language, you can also write using rich text, just like you would in Microsoft Word. Having another option is a nice touch; unfortunately it's not one that extends beyond the Mac. Only plain text documents will sync with iOS, so if you want to use bolding and italicizing across your devices, you'll need to get comfortable with asterisks and underscores. But it'll be worth it. Byword's iOS offerings are gorgeous exercises in style and restraint, delivering an experience that isn’t just minimal for minimal’s sake. While the iPhone and iPad versions offer identical interfaces and features, each of the two apps take advantage of the screen they’re presented with; for example, the iPad app presents your documents in a sidebar that isn’t feasible on the iPhone, but both utilize the same simple gestures to navigate between files. And you're not stuck with iCloud—Byword also lets you store files in your Dropbox folder for easier sharing between other apps. Byword on iOS includes many of the same excellent exporting options that the Mac version does, including PDF, HTML, and rich-text email. Also like the desktop version, a separate $5 in-app purchase lets you publish to WordPress, Tumblr, and Blogger, or upload to Scriptogr.am and Evernote, but it's even more useful on iOS, where cutting and pasting text between apps is much more tedious. But even if you just use it as a plain text editor, Byword will give your words a fantastic home, whether they’re traveling on your Mac, iPad, or iPhone. Back in the day, Microsoft Word was the go-to app for writers. Powerful and feature-rich, it offered something for everyone, whether you were writing the great American novel or adding footnotes to a lengthy research paper. But over the years, Microsoft surrendered its foothold, and now that it’s tied to a monthly subscription, many people are understandably reluctant to make the commitment. But you can still get a cross-platform Word experience without the rolling fees. On the Mac side, there are numerous apps that claim Word kinship, but they don't all deliver what they promise. TinyWord (Mac, $2) does. As its name suggests, it's not exactly overloaded with features, but Word users will certainly notice a distinct similarity in the interface. It can handle all of your .doc and .docx files with ease, and there are more than enough text and exporting options to keep your files looking their best. Tiny Word is just like Word, but … tinier. And when you need to transfer a document to iOS, just save it to your OneDrive and open it up in the free Microsoft Word app. TinyWord will maintain any formatted tables and fonts to keep things from getting messy, and you’ll be able to edit and save in the mobile Word app without needing a subscription. Microsoft has done an admirable job with the Word interface on iOS, adhering to the clean iOS aesthetic while still offering the features Word users crave. 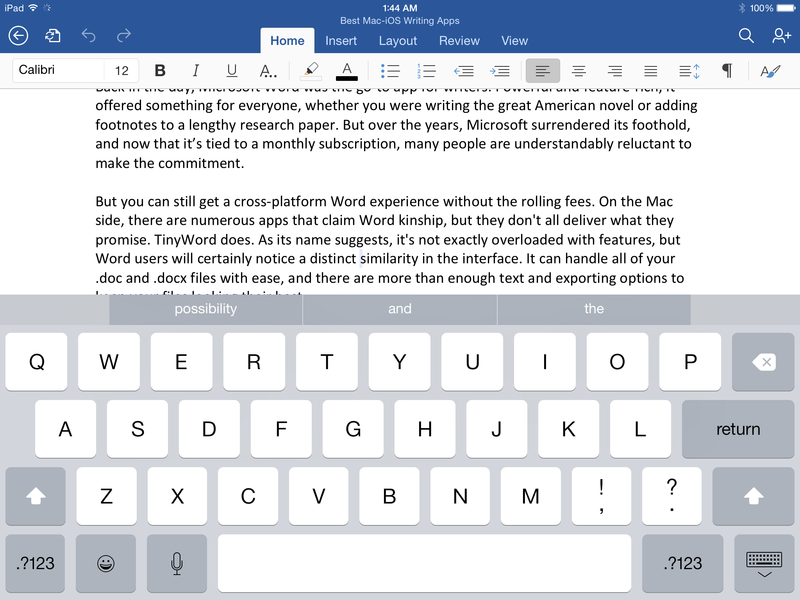 Office 365 users will get a few extra formatting and layout options, but even without a subscription, Word on iOS still feels very much like a premium universal app. 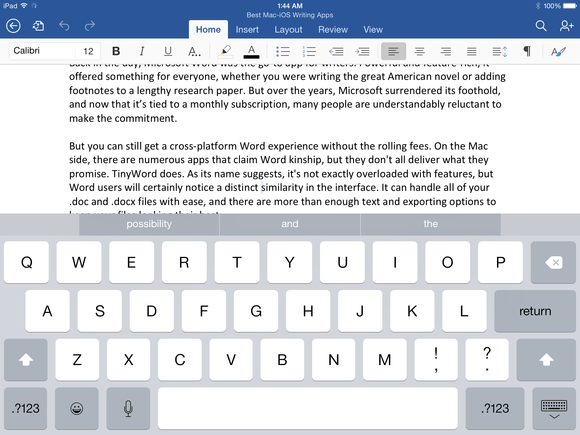 Microsoft Word on iOS might actually be better than the Windows Phone app. If you’re looking for a completely free way to write and edit on whatever Apple device happens to be at your disposal (and it’s been purchased within the past year and a half), you won’t find an app anywhere that beats Pages (Mac and iOS, free). Apple took its iWork suite in a new direction with its iOS 7 redesign, removing many of its professional features along with the price of admission. 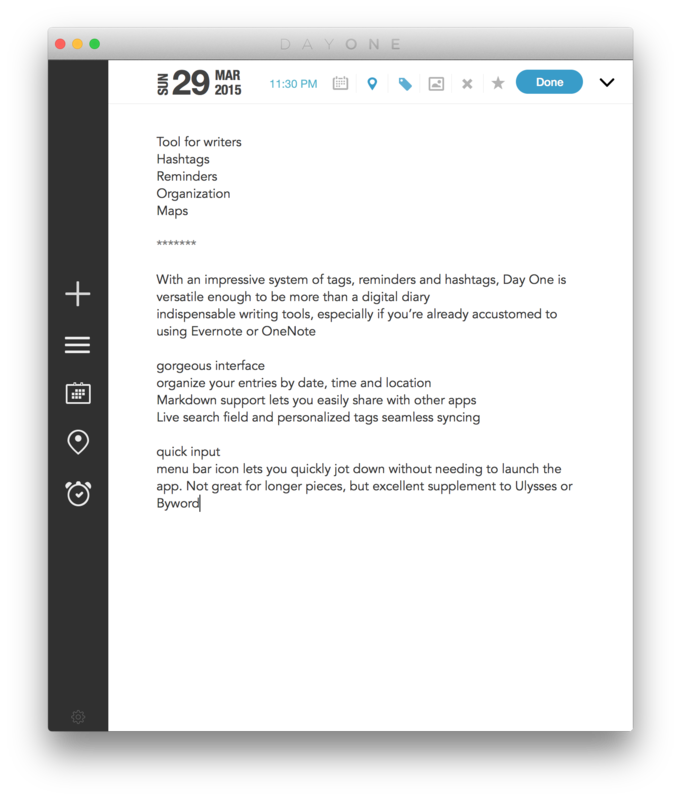 But even without things like mail merging, linked text boxes, and mailing labels, Pages is a fine tool for writers looking to quickly get to work. If you bought a Mac last year and didn’t download your free copy of Pages, go get it now. No matter which platform you’re using, there’s a clear focus on simplicity, with a sparse interface and a well-stocked library of templates. There’s no Markdown support, but headers, footers, and margins are all adjustable, and rich-text support maintains desktop-class uniformity across all of your devices. Pages makes the most of every pixel. But writers working in a standard template will be pleased with Pages' responsive layout and exporting options, which includes .doc as well as ePub and PDF. Documents are neatly formatted for each screen, and there's even a web component that lets you work on Windows PCs and collaborate with up to 100 other writers. And if you work alone, you can still utilize Pages' excellent annotations by inserting comments, monitoring changes, and highlighting parts you need to work on later. 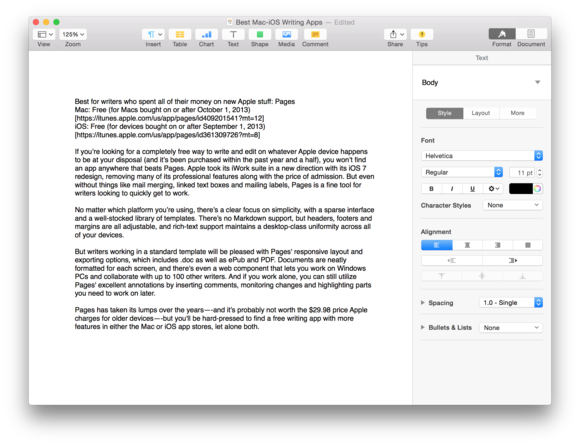 Pages has taken its lumps over the years—and it’s probably not worth the $30 price Apple charges for older devices—but you'll be hard-pressed to find a free writing app with more features in either the Mac or iOS App Stores, let alone both. Any of the apps here can double as a writing journal, but none of them let you personalize and simplify it like Day One (Mac, $10; iOS, $5) does. With an impressive system of tags, reminders, and hashtags, Day One is versatile enough to be more than a digital diary—with a little creativity, it can become one of your indispensable writing tools, especially if you’re already accustomed to using Evernote or OneNote to record your thoughts throughout the day. Day One doesn’t just have to be for selfies and food shots—it can also be a tool for organizing your thoughts.